To say that Pinky Yarman played basketball at Rittman High School would be an understatement. He was the gate attraction, the player everyone came to see play. He was tall and rangy and moved well with or without the ball. Records that Yarman set in those days (1935-38) still stand in the home of the Indians. Those who were around in the late 1930’s will remember that the ball was jumped at center court after each basket scored. This cut into the playing time of all ball games and forced the scores to be low (20-30 points per team). 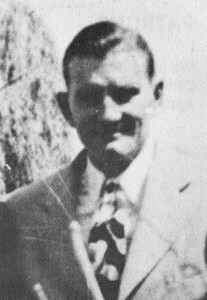 Yarman scored 50 points in a game on February 8, 1937 against Orrville. The final score of that game was Indians 61, riders 41. This 50 point outburst won Pinky national recognition, since it was such an unusual occurrence. He also scored in the 20’s in many of the games he played. The Central Buckeye League selected Yarman to its All-Star team three times (1936, 1937, and 1938). He also led the league in scoring all three of those years. The four years Pinky played a Rittman High, the Indians enjoyed a 68-15 won-loss record for an 82% winning percentage. Pinky also played football and baseball, but he will be remembered as a highly competitive basketball player who did more than his share of the work on both ends of the court and spared the Indians to some of their best years on the basketball floor. Pinky Yarman passed away in December of 1971 at the age of 51.